Cupcakes are small and cute mouthful of happiness. 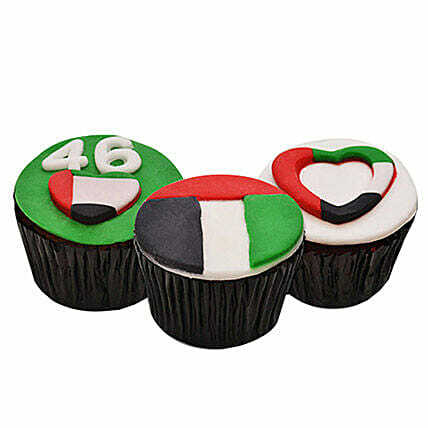 On the happy and proud occasion of UAE National Day, present this assortment of cupcakes depicting the year of independence and flag colors of UAE. Let’s celebrate this great day with a lovely taste. Every cupcake we offer is handcrafted and since each chef has his/her own way of baking and designing a cup cake, there might be slight variation in the product in terms of design and shape. Since cupcakes are perishable in nature, we attempt delivery of your order only once. The delivery cannot be redirected to any other address. Upon receiving the cupcake, immediately refrigerate it. The cup cake should be placed back in the fridge and should be consumed within 24 hours.